Children love snow and so do we! The crafts and activities in this theme offer snowy fun for everyone! Quite the challenge for this theme: learning to get dressed for winter. (Open steps for getting dressed for winter) Print and laminate. Leave the illustrations out for children to manipulate. They can have fun placing the steps in order while learning to get dressed on their own. Educatall team suggests an imaginary game you may enjoy with your group. (Open thematic letter - Snow) Print and prepare a sparkly envelope (glue sparkles and paper snowflakes on it) and place it in an easy to find location within the daycare. Children can search for the envelope. 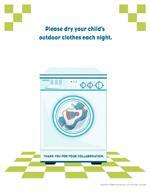 (Open poster - Dry clothes) Print and display for parents. (Open poster - Remove your boots) Print and display for parents. This decoration should be prepared by the caregiver. Use fishing wire and a needle to thread cotton balls. Add a dot of glue to make cotton balls stay where you want them on the wire. (Open craft - string of snow) Cut out the models. Place the model of your choice on folded sheets of paper and cut out the shape making sure not to cut the edges. When you unfold it, the shapes remain attached together, like a string of snow. Hang to decorate. Decorate your windows using stencils. Use white poster paint. Add a small quantity of hand soap or dishwashing liquid to the paint to make cleanup easier. If you wish you may simply use aerosol snow on windows and mirrors. The pictures may be used as a memory game or to spark a conversation with the group. Use them to decorate the daycare or a specific thematic corner. 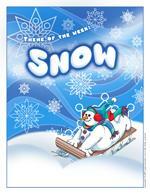 (Open picture game - Snow) Print, laminate, and store in a "Ziploc" bag or in your thematic bins. Make only white, blue, and gray blocks available providing you have enough. Cover the floor with snow...using a roll of cotton batting. Children will love building on the snow. Sort your animal figurines and keep only the ones which live where there is snow. Add a large container filled with salt (or sugar) and let children play in it with small cars. Figurines which may be used to represent skiers or snowboarders. Decorate the area with posters of snowmobiles, skiers, and igloos. A large quantity of sparkles and glitter glue. Construction paper, tissue paper, all kinds of paper in blue, white, and gray. Chalk which can be used to draw on dark paper. Cotton balls which can be added to drawings. Use waxed paper and white glue to make snowflakes. Draw the snowflake with the glue and let dry. Gently remove and you will have a beautiful snowflake! Miniature marshmallows which can be glued on paper to create wintery scenes. Sheets of white paper to cut out snowflakes. Pictures of winter clothing (or other objects) which can be cut out to make a mobile. White poster paint on dark, colourful paper. Coloring pages involving snowflakes, winter scenes, and winter sports. A large pot and bowls children can use to pretend they are making soup. Dishes for making pretend hot chocolate. Decorate the area with winter scenes. You can even craft a pretend window and add a winter scene. Craft a fireplace out of cardboard and add a few logs. 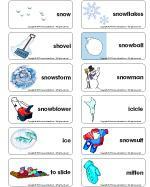 Memory game with educatall's winter illustrations. White, blue, and gray modeling dough. Add sparkles, children will love it! Association games involving winter sports (for example, a skate and an illustration of a child skating). Sugar cubes can be used to build igloos. Miniature marshmallows are perfect for building snowbanks. Stimulation bottles filled with white or wintery items. Books which include winter scenes. Photo albums which include pictures of your group playing outside. Blue and white miniature lights create a magical relaxation corner. A snowball fight (crumpled paper). Water table: use blue food coloring to make the water blue. Container filled with salt or sugar. Hide tiny objects in the "snow" or add pinecones or branches from a pine tree. Real snow with mittens and gloves. Bin filled with ice: when it is cold enough, simply leave a bin filled with water outside during the night. Children will love making figurines skate on the ice. Bin filled with cotton balls. Bin filled with whipped cream. This may become a taste test activity. Bin filled with powdered potatoes. Examine snowflakes using magnifying glasses. Catch snowflakes on dark construction paper. Melt ice (snow) and then freeze it. Using spray bottles, color the snow! Just add a few drops of food coloring or the felt from old markers to the water. Using several different thermometers, observe temperature changes. Bake a cake and top it with vanilla icing. Color combinations...add white to colors to see what happens. What happens when you combine water and flour? Make sculptures using mashed potatoes. (Open picture clue story - Snow) Print. Sit in a circle with your group. Begin reading the story. Pause for each picture clue. Point to the clue and have children guess the missing word. What do snowballs do? They roll! Have children roll like snowballs by performing somersaults or rolling sideways. 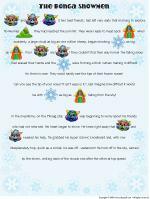 (Open models - small snowflakes) Print and cut out enough snowflakes so that you have at least ten per child. Deposit the snowflakes in the center of a parachute or a large blanket. Children firmly hold the edges of the parachute. When you give them the signal, they must raise the parachute. As the snowflakes fall to the ground, children must try to collect as many as possible. Have each child count how many snowflakes they collected. Variation: Instead of tiny snowflakes, you may use cotton balls, Styrofoam balls, etc. Spread a white sheet over a table. Fill a container with snow and winter figurines. Add books about polar animals. Children play in their igloo, under the table. Provide a blanket. Have children tear tons of tiny pieces of white paper. Have them deposit the pieces of paper on the blanket. Children hold the edges of the blanket and have fun moving it up and down to see the "snow" dance on the blanket. When all the pieces of paper are on the floor, children pick them up and put them back on the blanket to start all over. Provide children with several containers. Fill them with sugar, salt, flour, or rice. Let children play in the containers with small figurines or cars. They will discover new textures. Empty ten bags of cotton balls in the center of your daycare. Children will have fun throwing the cotton balls in the air. They can also roll around in the cotton balls or lie down on them. They can use the cotton balls to create snowy streets or anything else they may think of. (Open models-fish - Winter-1) Print and have children color the fish. Cut them out. Attach a string to the end of an old broomstick. At the end of the string, hang a clothespin. Sit behind a couch or other piece of large furniture and attach fish using the clothespin. The object of the game is for children to take turns "catching a fish". You can attach small toys or surprises instead of fish if you prefer. Variation: Write points on the fish (example: small fish, 2 points; big fish; 5 points, etc.) Divide the group into teams. At the end of the game, add up each team's points to see which team wins. This game can be done outdoors, simply laminate the fish and hide behind a snowbank. Use Kleenexes or newspaper to make balls. Select targets throughout the daycare. Encourage children to throw "snowballs" towards the targets. Build forts or igloos using empty Kleenex boxes, paper bags stuffed with newspaper, or any other recycled material. Have a boot or mitten race. Deposit all the mittens or boots in the center of the room and have children search for their pair. Children pretend to be snowflakes. Give them various instructions such as, "The wind is blowing on the snowflakes and making them twirl around," or "The snowflakes are falling to the ground." Use yogurt or apple sauce containers. Add water and a few drops of food coloring to each container. Deposit them in the freezer. Remove the ice from the moulds and bring them outside. Let children use the little blocks of ice to make various constructions in the snow. We suggest preparing a large quantity of ice blocks ahead of time to guarantee you have enough for everyone. Children's constructions will last as long as the temperature remains below freezing. The leader of the game must walk in the snow in straight lines, zigzags, circles, etc. The other children try to follow him by walking in his footprints. Using your feet, draw a path in the snow. Children must walk only in your path. Take a walk with your group and observe the tracks you leave in the snow. Show children how to lie down on their backs and move their arms and legs to make snow angels. Help them stand up so they do not walk on their angels. Gather your sleds and go sledding with your group on a hill near your daycare. For this activity, it must be cold and not too windy outside. Blow a soap bubble but do not let it float away. As it freezes, watch closely and you will notice the formation of ice crystals. If you leave it on your wand long enough, it will transform into a crystal ball. Laminate a black sheet of construction paper for each child. Go outside and show children how to hold out their piece of paper so that snowflakes fall on its surface. Use magnifying glasses to examine the snowflakes. Paint snow using spray bottles filled with coloured water (simply add powdered paint or poster paint). It may be a good idea to wear old mittens for this activity. Select an object with your group. Designate a child to hide the object in the snow. The other children search for the object. The child who finds it is the next one to hide the object. Prepare several colourful ice cubes with your group. Once set, remove the ice cubes from the moulds and hide them outside. Have children search for them. Depending on the ages of the children in your group, you may ask each child to collect only ice cubes of a certain color. One child puts on his snowsuit, omitting one clothing item. The other children must guess what is missing. Provide several catalogues. Ask children to cut out clothing which can be worn to play outside in the snow. Children sit in a circle. Select one child to leave the room. While the child is in the next room or hallway, another child becomes a snowman. Simply drape a large white sheet over him. When the first child returns, he must guess who the snowman is. (Open game - Snow) Print. Children must associate the illustrations to the correct activity. (Open lacing - Snowflake with holes) Print on heavy cardboard and laminate. Punch holes around the contour of the snowflake using a hole-punch. Have children thread a shoelace or ribbon in each hole. (Open sequential story - Snow) Print the story. Laminate and cut it out. Children must place the illustrations in the correct order. Add clean snow to a large bin and invite children to build a snow castle. Children will realize just how quickly snow melts and transforms itself into water. Next, use an aluminum plate. Pour water from the melted snow into it. Leave the plate outside and encourage children to notice how the water turns into ice. Combine one cup of water with two cups of cornstarch. Stir. The mixture is ready when it can easily be removed from the edges of the bowl. The mixture seems liquid. However, if you hit it, it will not splash. This phenomenon is a liquid when it is not under pressure but becomes a solid when pressure is applied to it. Give each child a handful of the mixture. Suggest they make a ball with the magical snow. Children will notice that the ball remains a ball when we press it but becomes liquid as soon as they stop manipulating it. If this activity is done indoors, it should be done over a table and have children wear paint smocks. Cornstarch does not stain. When the activity is over, simply brush clothing with a small brush and there will be no traces of your experiment on children's clothing. Making your own taffy-on-the-snow is easy. Empty the contents of a can of maple syrup in a pot and bring to a boil. Maple syrup must boil until it reaches 230⁰F. Do not stir and be sure to use a large pot because the syrup tends to bubble over. Fill a large plastic container with clean snow and pour syrup on it. Let children add a small quantity of water to potato flakes. The result will be a more or less thick mixture which is fun to manipulate. This activity is ideal for young children since the mixture is nontoxic. Prepare meringues and serve them as a snack. Use mittens to make puppets. Get your puppet theater out and let children invent their own stories. Children sit in a circle. To the sound of music, children pass a tuque around the circle. When the music stops, the child holding the tuque is eliminated. Invite the child to decide when the music stops for the next round. To play in the snow, we need mittens. Trace children's hands on the material of your choice. Let children decorate their pair of mittens. On dark paper, children draw with white chalk, white waxed crayons, white wooden pencils, etc. Let children paint with cotton balls on dark blue or black paper. Children simply dip cotton balls in white paint and stamp them on the paper. Collect different sizes of round objects (garbage can lid, plate, etc.) Give each child one large sheet of paper. Encourage them to trace the objects you have collected to draw a snowman. Show them how the biggest circle must be at the bottom, the medium circle in the center, and the smallest circle at the top. Let children decorate their snowman by adding a hat, a nose, a mouth, a broom, etc. (Open craft - snowflake) Print and cut out. Let children glue cotton balls on their snowflake. On black paper, draw a winter scene with a glue stick. Sprinkle flour on top. Shake off any excess flour. 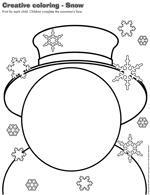 (Open model - giant snowman silhouette) Print one snowman per child. Provide miniature marshmallows and glue. Invite children to fill the snowman shape with marshmallows. Create a snowman by gluing miniature marshmallows on dark paper. Children paint a wooden spoon white. Make a nose out of modeling dough and let dry. Cut a hat out of black felt. Once the nose is dry, glue it on the spoon and draw other details using markers. You may use pink chalk to give the snowman rosy cheeks. Glue cotton balls on the handle to represent the snowman's body. Add tiny black buttons to the snowman's body. Make a giant snowman by stuffing three white garbage bags with newspaper. Make sure each bag is a different size. Pile them one on top of the other. Draw a face on the smallest bag using a marker and add accessories such as a hat, a scarf, etc. (Open craft - snowman) Print for each child. Children glue the pieces on construction paper. Have them color and cut out the pieces. They can build their own snowman! (Open model - snowman silhouette) Print for each child. Prepare popcorn. Dip the popcorn in corn syrup and fill the snowman outline. Let dry. Use fishing wire to hang from the ceiling. First step: Have each child paint both sides of four Popsicle sticks with white paint. Sprinkle them with sparkles before the paint dries. Second step: Once the Popsicle sticks are dry, glue two of them together so they look like a cross. Add the third and fourth sticks transversally and let dry. Third step: Use transparent thread to hang the snowflakes from the ceiling. You may choose to have each child make several snowflakes to decorate the daycare further. Let children manipulate any type of white foamy texture such as whipped cream or shaving cream depending on the ages of the children in your group. (Open creative coloring - Snow) Print for each child.